With the recent 40th anniversary of the fall of Saigon, I’ve been thinking a lot about immigration: the stories of how people get around. How we face moving as a choice or as a last resort and how communities can or cannot embrace newcomers. I was a very young child when Saigon fell to north Vietnamese forces on April 30, 1975. I finally became more aware of Vietnamese refugee movement later in my childhood. At the time, my family belonged to the congregation of a Chinese Catholic church. The church, like many others of the time, began to sponsor Vietnamese families fleeing from Vietnam. I didn’t think much of it at the time. I can only recall two things that made any impact on my life: new choir members and crunchy, piping hot Vietnamese spring rolls sold at the annual church bazaar. If this was what welcoming newcomers was about, I was all for it! I’ve been reading posts by Andrea Nguyen over at Viet World Kitchen and her family’s experiences as refugees from Vietnam early in the fall of Saigon. I was moved by her and many others’ families’ courage to leave everything behind and start anew without knowing what to expect. And I was also moved by the people who received them with open arms. Although the experiences were daunting and emotional beyond what I could ever imagine, Andrea writes from a place of gratitude and “looking back to move forward.” She marvels at how she and many with similar experiences have made it in the world. And she’s grateful. I’m grateful she and so many others of Vietnamese heritage were given the opportunity to make a new life and share their talents with the rest of us. Now I reflect on our current tight world immigration policies and wonder what kinds of talented people and their stories we’re shutting out. 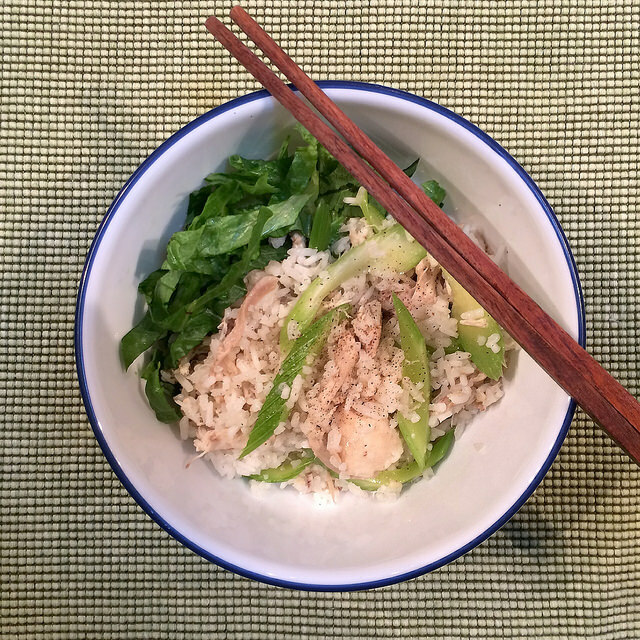 Here is Andrea’s recipe for chicken back and celery rice. Something about this recipe really struck a chord with me. Not only did it sound absolutely delicious, it reminded me of my Grandma who also lived through a lot of uncertainty raising two kids as a young widow.